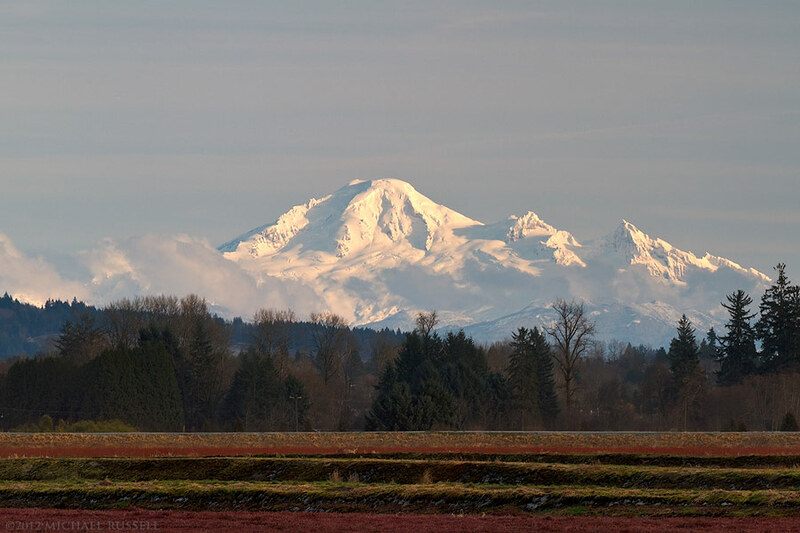 Growing up in the area around Vancouver, British Columbia, especially out in the Fraser Valley, Mount Baker is a constant presence on the Eastern horizon. Many roads seem to point straight towards Baker or sometimes Mount Shuksan. While I am most familiar with the view of Baker from Langley, it can be seen all the way from Stanley Park in Vancouver, the Southernmost point of the area in Tsawwassen, and from North of the Fraser River – here in Pitt Meadows. I made this photograph from the edge of one of the many Cranberry fields on the road to Pitt Lake. As Baker is such a constant for anyone living out here, it was quite a surprise for me as a kid to realize that it was not a Canadian mountain – it actually is in Washington State. I was young enough that I am not sure I believed that right away.